Incoming data suggests that growth momentum is largely holding up across the Latin American economy and the recovery remains firmly underway. FocusEconomics analysts estimate that GDP expanded 1.6% annually in Q3, above Q2’s 1.1% increase. If confirmed, the result would mark the fastest growth rate since Q1 2014. Although official Q3 GDP figures are still outstanding from the majority of economies, growth is expected to have picked up nearly across-the-board. Regional giants Argentina and Brazil are seen as having gained steam as their economies emerge from deep recessions. In Brazil, low inflation and improving labor market dynamics are supporting household spending, while painful economic reforms are finally beginning to bear fruit in Argentina. However, major player Mexico defied the regional trend, and a preliminary estimate revealed that growth lost some steam in Q3. High inflation and disruptions from two earthquakes in September weighed on the result; however, robust external demand and healthy tourism revenues propped up growth. Meanwhile, Venezuela’s economy continues in free fall, although a lack of official economic data makes the full extent of the recession difficult to judge. In the political arena, the region’s election cycle kicked off with a key mid-term legislative election in Argentina on 22 October. President Mauricio Macri’s coalition made broad gains, including in the five largest cities. The result should provide momentum to his ambitious reform agenda, which is aimed at shrinking the government’s chronic fiscal deficit and enacting pro-business policies. Next on the agenda, Chile will go to the polls in a presidential election on 19 November. Early polls point to a victory for center-right former President Sebastian Piñera, who is seen as pro-business and would likely lead to a greater government focus on boosting competitiveness and investment. After a tough 2016, the Latin American economy is expected to have returned to growth in 2017, expanding 1.4%. Next year, stronger recoveries in heavyweights Argentina and Brazil will boost growth further. However, political uncertainties are plaguing the outlook as votes are set to take place in Brazil, Colombia, Mexico and Paraguay. NAFTA renegotiations are also clouding the outlook for the Mexican economy. LatinFocus Consensus Forecast analysts see regional GDP increasing 2.4% in 2018, unchanged from last month’s forecast. In 2019, growth is seen at 2.7%. This month’s unchanged 2018 outlook reflects stable growth prospects for 5 of the 11 economies surveyed for this report, including Brazil and Mexico. However, growth prospects improved for Argentina, Ecuador, Paraguay and Uruguay. Colombia and Venezuela’s outlooks were downgraded. Peru is expected to be the region’s fastest-growing economy next year, with projected growth of 3.9%, followed closely by Bolivia and Paraguay. At the other end of the spectrum, Venezuela is seen contracting 3.6% and Ecuador is seen growing 1.3%. President Michel Temer survived another crucial vote on 25 October, and will avoid being put on trial for corruption charges. The final tally showed 251 deputies were in support of the president, who is facing the worst approval ratings on record. While continuing stability is key for the Brazilian economy’s recovery, the number is far below the 308 votes needed for a supermajority to pass the current version of the critical pension reform, which could be a bad omen for the bill’s fate. The reform is key to improving the country’s fiscal situation; however, the window for reforms is rapidly closing as politicians begin to eye next year’s elections. Meanwhile, incoming data suggests that the recovery is gaining steam, following the resumption of growth in the second quarter. In the three months up to September, the unemployment rate fell to the lowest level seen in 2017, and both business and consumer confidence climbed in October. Low inflation, an improving labor market, and looser monetary policy should support a pick-up in growth next year, but uncertainty surrounding the 2018 election is high. FocusEconomics see the economy growing 2.3% in 2018, which is unchanged from last month’s forecast. In 2019, growth is seen edging up to 2.5%. A preliminary estimate by the Statistical Institute revealed that growth took a larger hit than expected in Q3, sliding to an over three-year low. Economic disruptions from two earthquakes, along with subdued consumer spending in the face of high inflation, drove the slowdown. However, activity is expected to bounce back in Q4 as reconstruction efforts boost construction and a favorable external environment drives exports. Meanwhile, increasingly negative noise continues to emerge from the NAFTA negotiations. The latest round of talks culminated in both Canada and Mexico rejecting U.S. demands, and the parties remain far apart on the divisive issues. In the domestic arena, Petróleos Mexicanos (Pemex) announced the largest onshore oil discovery in 15 years at the start of November, boding well for the battered oil sector. Dwindling output has plagued the national oil company for years. Uncertainty over the upcoming elections and the renegotiation of NAFTA will likely plague the economic outlook until clarity emerges on the future deal. FocusEconomics analysts took a wait-and-see approach this month and left the 2018 growth forecast unchanged. Our panel expects GDP to expand 2.3% in 2018 and 2.4% in 2019. President Mauricio Macri obtained a resounding victory in the mid-term legislative elections held on 22 October. The better-than-anticipated result helped cement his legislative power, and the country’s outlook for reforms is brighter than it has been for decades. Macri is expected to introduce sweeping reforms to tax, labor and pension laws, among others, to open up the country to foreign investment and foster faster domestic growth by improving productivity. However, the scope of the reforms remains uncertain, since the ruling coalition lacks a majority in both the senate and congress and has to strike deals with the opposition and other key political actors. Although the victory attests that Macri’s painful reforms to mend economic distortions and modernize the economy have put the country on a steady recovery path, obstacles remain. The Central Bank raised interest rates in October after disappointing inflation data in September. The widening current account deficit, which could weaken the peso and hinder efforts to lower inflation, is also of increasing concern. The country’s economic outlook improved in the aftermath of the election due to growing optimism on the reform outlook as well as expectations of increased public spending. FocusEconomics panelists see the economy expanding 3.1% in 2018, which is up 0.1 percentage points from last month’s forecast. For 2019, growth is expected to reach 3.2%. Colombia’s economy continued to recover in Q3, albeit at a gradual pace. The external sector received a boost in September on the back of a strong acceleration in oil and refinery exports. A pick-up in energy demand and higher oil prices are helping the oil sector begin to stabilize after its near collapse in 2016. Moreover, favorable weather conditions translated into higher output in the agricultural sector, especially in coffee production; agricultural exports grew by a double-digit rate in September. Furthermore, the trade deficit narrowed in annual terms in August, underpinned by a contraction in imports. On 18 October, Colombia’s congress approved a USD 80 billion budget for 2018, which is only marginally larger than the 2017 budget. The government is attempting to implement austerity measures to reduce spending in the face of sluggish growth and to cut the fiscal deficit in 2018. It also announced it will not issue any more international bonds as it tries to curb its foreign debt. Economic growth should accelerate heading into 2018, carried by stronger domestic demand, which should firm up from higher private consumption and private investment. The former is on the rise thanks to lower inflation and more stable unemployment, while the latter will benefit from projects in civil works and the mining sector. FocusEconomics panelists expect GDP to grow 2.6% in 2018, which is down 0.1 percentage points from last month’s forecast, and 3.1% in 2019. A comprehensive inflation estimate suggests that inflationary pressures in Latin America—without considering the current period of near hyperinflation in Venezuela—were steady in September. The FocusEconomics regional estimate showed that inflation in Latin America (excluding Venezuela) was 5.3%, matching August’s revised result and marking a multi-year low. Preliminary data for October revealed that inflation dropped in Peru, price pressures rose in Colombia, Paraguay and Uruguay. October data for the remaining economies is still outstanding. Venezuela is experiencing an episode of near hyperinflation; if we include it in the aggregate, inflation in Latin America is projected to end 2018 at 56.0%. Excluding Venezuela, inflation in Latin America is expected to be 5.3% next year. 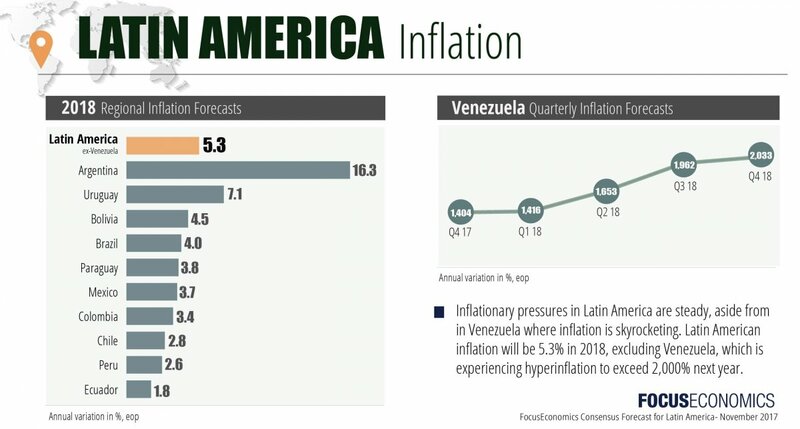 In 2019, analysts project regional inflation excluding Venezuela to fall to 4.6% (32.7% including Venezuela).